I have a suspicion that anyone reading this review is probably doing so for the trainwreck factor; I’ve certainly done that when the reviewer covers an infamous comic or one I disliked. Well, perhaps I’ve become jaded over the past few months, but the violence in Legion of Doom #3 wasn’t enough to make the story exciting. Continue beyond the cut for further spoilers. The best parts of the story are the ones which involve Plastic Man, which is a bit problematic because he doesn’t appear much. There’s some good dialogue differentiating between him (who freely kills when necessary) and Heat Wave (a complete psychopath who kills anyone who gets in his way, including innocents). When Plastic Man — a fellow who fatally claws his way out of prisoners’ bellies — believes you’ve gone too far, then obviously you have a serious problem. But Heat Wave seemingly kills him early on, and that takes Eel out of the story. Afterwards it’s Heat Wave vs Cyborg, and despite a desperate struggle to keep the flying prison from crashing into downtown Detroit, I still didn’t find most of the plot very interesting. The most effective parts of the series aside from Plastic Man have been Heat Wave interacting with other characters, and the scenes focusing on Cyborg’s point of view lack that. 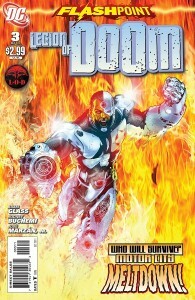 Cyborg himself is fairly dull, lacking the dramatic crackle of the two villains who have kept the story moving. Fortunately the series ends on a high note with the surprising return of Plastic Man, and Heat Wave finally gets what he deserves (and even he seems to acknowledge this). Strangely I felt mildly sorry about it, so either I too am a psychopath, or Adam Glass managed to make Heat Wave at least slightly likable despite all the gruesome killings. Hopefully it’s the latter. Incidentally, here’s the gore count for the issue: one guy gets his eyes gouged out, Sportsmaster has his heart ripped out through his mouth, and Plastic Man is melted into goo. Many of the prisoners are killed when the prison crashes, Heat Wave and Cyborg beat the stuffing out of each other, and Plastic Man climbs out of another prisoner’s belly. He presumably then kills Heat Wave off-panel. I don’t think this series will be remembered in a good way. Don’t get me wrong: if somebody enjoyed it then I’m sincerely glad, and don’t let some random idiot on the Internet tell you what you should and shouldn’t like. However, while there was certainly skill involved in the crafting of this series, it was somewhat misplaced. It didn’t belong in a non-mature imprint, and the amount of gore was unnecessary regardless. A gritty prison story can still be told without seeing squirting blood as a guy’s head gets crushed, and this should certainly be the case when the book is part of the mainstream DC line. In all honesty, I think the violence overshadows the rest of the story, which is unfortunate; I enjoyed Glass’ dialogue and characterization of the villains, and the art was well-suited for the piece. But it’s the violence that will always be remembered, and that’s not really a good thing. This entry was posted in Reviews and tagged Adam Glass, Animal Man, Flashpoint, Heat Wave, Legion of Doom, Plastic Man, Rodney Buchemmi on August 22, 2011 by Lia. Yep, this was pretty awful, and I agree with you. The only character I enjoyed was Plastic Man. I thought Glass did his worst work when writing the Heatwave dialogue. Of all the minis I bought, this was by far the worst. Hmmm, I actually found Heat Wave’s dialogue to be fun — but then, I like sarcastic smartasses :> It’s all subjective, of course, as there haven’t been a lot of comics I thought were objectively bad (though they do exist). I agree with Lia and married guy. The level of violence and gore in this miniseries seemed way over the top. One of the least enjoyable Flashpoint miniseries. yes, this one was gory, big time… but its not alone. secret 7 was nothing but a blood bath. No kidding. I was really looking forward to Justice League Dark until I read Secret Seven. Now, I’m not so sure. I’ve been pretty sour on Milligan since his disastrous run on X-Men. Maybe it wasn’t his forte or a series he belonged on, but ye gods it was awful. Which is why I’m on the fence about Red Lanterns, something I’d normally be all over. The gore was way over the top. But once I learned that was how it was going to be in the series I actually enjoyed it. It wasn’t fantastic, but I liked it. Also, Cyborg saves the Joe Louis Arena while the Red Wings are playing inside it, that makes him the best superhero EVER. Apparently, the same guy responsible for this over-the-top gorefest will the writer for Suicide Squad. Just so you know. I didn’t know this. I have been looking forward to SS but I hope that LoD is the consequence of DC’s throwing things together at the last moment before relaunch rather than his writing style. I’m not familar with his past work so I don’t really have anything to compare it to. Yeah, and I was already not keen on what we’d seen for the Squad series (despite being a longtime Squad mark). I certainly wouldn’t rule out the SS book being good or even great — I do think Glass has talent — but even if it is, it probably won’t be to my taste.